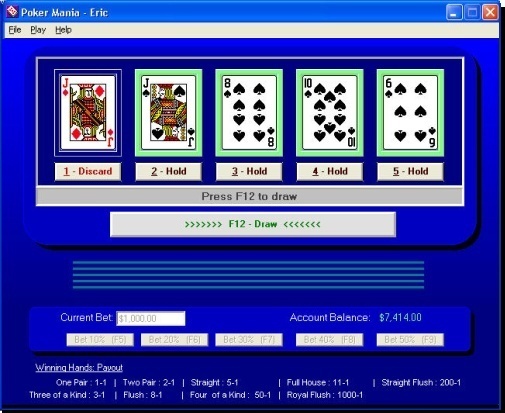 This enjoyable (FREE) game simulates all the fun and action of video poker. This enjoyable (FREE) game simulates all the fun and action of Vegas-style video poker machines. Its friendly interface is very easy to use and sports both visual and sound effects to enhance your playing experience. The polished help system will help you fine tune your playing skills and develop winning strategies with a tutorial that teaches you which cards to hold and which to discard when holding certain cards. As you practice these tips, they will become natural to you: which will help you regardless of whether you are playing video poker or you are playing with live players in a poker game. You can set up different players, save scores to resume a marathon game later, and keep track of all the high scores. Have fun watching your account balance grow as you become a better poker player and learn the strategies of winning. Changes: Updated graphics to enhance the presentation. Minimum requirements: 1MB of free hard disk space. 1) You may distribute unlimited copies of this program in its original form to any legal place unless I notify you otherwise. 2) You may charge a copying/distribution fee as long as the total does not exceed $9.00. 3) You must make it clear that users are NOT purchasing the software and that they must contact the author to legally purchase it. USE OF THE SOFTWARE PROVIDED WITH THIS AGREEMENT (THE "SOFTWARE") CONSTITUTES YOUR ACCEPTANCE OF THESE TERMS. IF YOU DO NOT AGREE TO THE TERMS OF THIS AGREEMENT, DO NOT INSTALL AND/OR USE THIS SOFTWARE. USER'S USE OF THIS SOFTWARE IS CONDITIONED UPON COMPLIANCE BY USER WITH THE TERMS OF THIS AGREEMENT.